Happy new year! 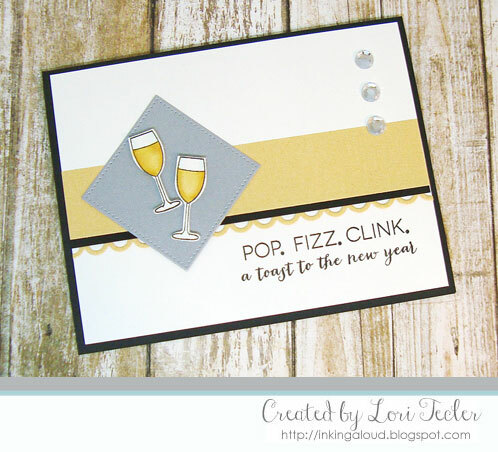 My first card for 2018 is based on the current sketch at Match the Sketch. A tiny pair of glasses from the Clear and Simple Stamps Taglines: By the Glass set serves as the focal image. I colored the glasses with Copic markers and added some sparkle with a clear glitter pen before attaching them to an angled pierced square die cut. The square die cut was adhered to a white panel over a gold paper strip edged with a contrasting black strip and an elegant edge, courtesy of CSS's Border: Eyelet dies. I stamped the new year sentiment from the CSS New Year Cheer stamp set beneath the gold strip, then added a trio of clear crystals along the top right side of the panel. The finished panel was adhered to a black card base. Cute card Lori! Happy new year to you and yours.